Deciding you’re going to pop the question is only half of the challenge. After that, you need to decide how to do it. It needs to be just perfect. For many couples, this means an evening spent in a sentimental location, with dinner and drinks, followed by a romantic speech and the question asked on one knee. For other couples, it can mean a day spent in together bringing a new baby into the world, followed by a quick costume change and a surprise proposal. That’s exactly how new dad J R Bomba decided to pop the question to his girlfriend and the mother of his new baby. What better way to propose than with the help of your beautiful newborn daughter? Bailey Bomba is a lucky little girl who got to play a big part in her parents’ engagement. After all, who could say no to such a pretty baby? Shortly after the birth, in a room filled with medical staff and close family members, the new grandparents kept new mama, Laney Henson, distracted while her newborn baby had her first bath. 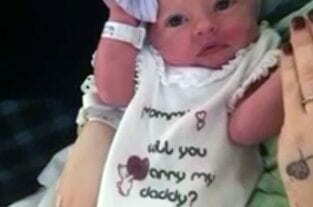 Once she was dry, baby Bailey was dressed in a specially made babygro which had “Mommy, will you marry my Daddy?” printed on the front. Captured on film, J R holds and kisses his newborn daughter whilst telling Laney just how much he loves her. He then gently passes the baby across to her mother who immediately bursts into tears upon seeing the babygro. J R then gets a ring box out of his pocket and gets down on one knee for the actual proposal. 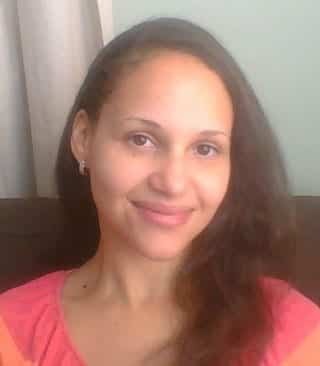 Laney, still crying, cries out ‘yes’ much to the delight of the family members surrounding the bed.